Arizona’s approximately 600 charter schools spent $128 million more on administrative costs during the 2014-15 school year than traditional public districts would spend on the same number of students. While every state agency, including public schools, are held accountable for the efficient use of state funds by the Office of the Auditor General, charter schools are exempt by law from scrutiny by the Auditor General. Charter schools in Arizona are held accountable for their academic performance through an Academic Performance Framework created by the Arizona State Board for Charter Schools, the only agency with oversight responsibility for charter schools. The Charter Board does not monitor how charter schools expend funds on administration or instruction. While charters are required to submit annual financial reports to the Department of Education, they are not compiled or analyzed by the Auditor General. The Auditor General’s reports on traditional public school district spending has led to public policy debates regarding how money ought to be best spent. Unfortunately, nothing is known about charter school spending because they are not held to any actuarial standard. This study involved the labor-intensive process of accessing 2014-15 Annual Financial Reports for each charter and public district as filed with the Arizona Department of Education and recording maintenance and operations expenditure data so that charter and public school district spending on administration could be accurately compared for the first time. Enrollment data was collected from the October 1, 2014 Enrollment Report, so per pupil expenditures could be calculated. This report is the first in a series on charter school accountability in Arizona. 2. The $775 per student administrative cost gap partially results from the smaller size of charters. Larger charter holders should be more administratively efficient. Instead the largest charter companies are among the most expensively managed agencies in Arizona. Their administrative costs are substantially higher, not lower, than the typical charter operation. If the seven largest charter holders spent the same on administration as traditional public districts, the state would save $54 million annually. 3. One of the largest charter companies, BASIS, Inc. (8,730 students) spends more on general administration than any charter or public district in the entire state, nearly $12 million. BASIS spent 30 times more per pupil on general administration than the six largest public districts combined (225,000 students). 4. The lack of transparency provided by Arizona charter legislation makes it impossible to determine how these funds are being spent. Consequently, greater oversight of charter school expenditures is needed. Arizona’s charter legislation was designed to free charter schools from most regulations and reporting requirements and enable them to more efficiently utilize resources in the classroom, not for added administrative expenses. Charter schools can opt out of all procurement procedures and avoid having to get competitive bids on major purchases. They can also opt out of following the Unified System of Financial Records, the accounting guideline required by the Auditor General for districts, so charters can keep accounting costs to a minimum. General Administration—Activities concerned with establishing and administering policy for operating the school, including governing board services, Executive administration services, and lobbying. School Administration—Activities concerned with overall administrative responsibility for a particular campus, including office of the principal services. Central Services—Activities that support other administrative and instructional functions, including fiscal services; purchasing; warehousing and distributing services; printing, publishing, and duplicating services; planning, research, development, and evaluation services; public information services; personnel services; and administrative technology services. The components within these categories are identical for both public schools and charters, enabling a fair comparison. Despite these potential efficiencies, charter schools spend over twice as much as traditional public districts on the three areas of administration, costing the state $128 million a year. Districts spend an average of $628 per pupil on administration. Charters spend $1,404 per pupil—$775 per pupil more than districts. Charters tend to be smaller than school districts. Research into the cost functions of public schools do show that economies of scale exist for administrative costs. Most studies, however, fail to pull out administrative costs as a separate entity in cost functions, as the cost of running schools are a combination of many factors such as student: teacher ratio, number of students from impoverished backgrounds, number of special education students, rural v. urban locations, labor costs, school size, and district size. Given that the typical charter operator in Arizona appears to have about 550 students, while the average public school district has about 4,700 students, economies of scale could explain much of the cost gap. Research on New York State on the varying sizes of public school districts suggests per pupil administrative costs could be double due to this size difference. However, research that focused on administrative costs between charters and traditional public schools in Michigan suggests the size difference might only explain about $130 of the per pupil gap. Arizona is not alone in noticing higher administrative costs for charters, and especially higher administrative costs for the larger corporate charters. In Michigan charters are funded comparably to traditional public schools. In a 2012 study professors David Arsen of Michigan State University and Yongmei Ni of the University of Utah found that charters spent slightly more than double the amount on administration as public school districts, approximately $1,000 more per pupil. When they controlled for enrollment, special education and percent of students on free and reduced lunch, being a charter operation raised per pupil administrative costs by $774, nearly the exact difference found in this study. A key culprit they noted were education management companies frequently contracted with by large corporate charters. In 2001 John Chubb promoted them arguing, “Critics of private management ask, What can business do that the public sector cannot? The answer is, Anything that requires scale to accomplish.” He then went on to exclaim how educational management companies would be able to drive down administrative overhead costs. Instead, in practice, educational management companies drive up administrative costs. In the Michigan study, charters contracting with educational management companies had $312 higher per pupil administrative costs than other charters with many other factors controlled for including enrollment, students in special education, students on free and reduced lunch, and type of charter school. This report finds the seven largest charter operators, who all contract with educational management companies, have per pupil administrative costs that are $406 higher than the overall average for charter schools. The data for this study comes from Annual Financial Reports (AFRs). Only elementary, union high school and unified districts were examined in the study. Vocational districts and county accommodation districts were omitted because their programs are not comparable to either districts or charters. Only charters that submitted an AFR in 2015 were included. Some charter operators file AFRs by school when they operate multiple facilities and some do so for all their operations in the state. Consequently, some operators have multiple AFRs and others a single one. As a result, potential economies of scale may not be apparent from just browsing AFRs. Table 1 shows those AFRs which demonstrated the highest administrative cost per student. As might be expected, some of the schools are extremely small. Of the 50 charters with the highest administrative spending, however, 15 are schools owned or managed by these largest charter companies in the state, which should be exhibiting economies of scale. Sixteen of the 30 charters with the lowest administrative have less than 400 pupils. These are highlighted in green in Table 2. Likewise, Table 2 also illustrates in blue that many large operators, filing a single AFR, have low administrative costs: Premier Charter High School, The Odysssey Preparatory Academy, Inc., EDUPRIZESCHOOLS, and Benjamin Franklin Charter School. Charter schools in Arizona are held accountable for their academic performance through an Academic Performance Framework created by the Arizona State Board for Charter Schools, the only agency with oversight responsibility for charter schools. Charters must align their curriculum to Arizona Standards and are required to participate in state mandated testing. Charters can be sanctioned, including revocation of their charter, if they fail to have adequate academic performance. The Board, in its oversight responsibilities, holds charter holders accountable for the timely submission of AFRs and tracks the timely submission of budgets through the compliance portion of the annual audit. The Board does not utilize the information contained in those documents in its oversight; rather, the Board has adopted a Financial Performance Framework and an Operational Performance Framework for its purposes in monitoring the charter holders in its portfolio. … The purpose of the financial framework is to communicate the Board’s expectations for ensuring that all charter holders in its portfolio are viable organizations with strong fiscal management practices. As an illustration, Kaizen Schools, managed by The Leona Group LLC., has three schools in the top ten list of highest spending charters for administration in the state. 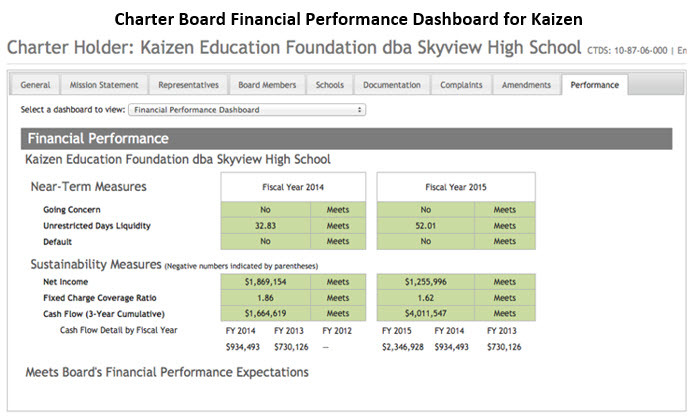 Yet the Charter Board’s Financial Performance Framework found Kaizen Schools to meet all expectations, even though they are one of the most inefficiently managed schools in the state. Kaizen Schools have good cash flow and a net income ( profit). That is the only concern of the Charter Board. 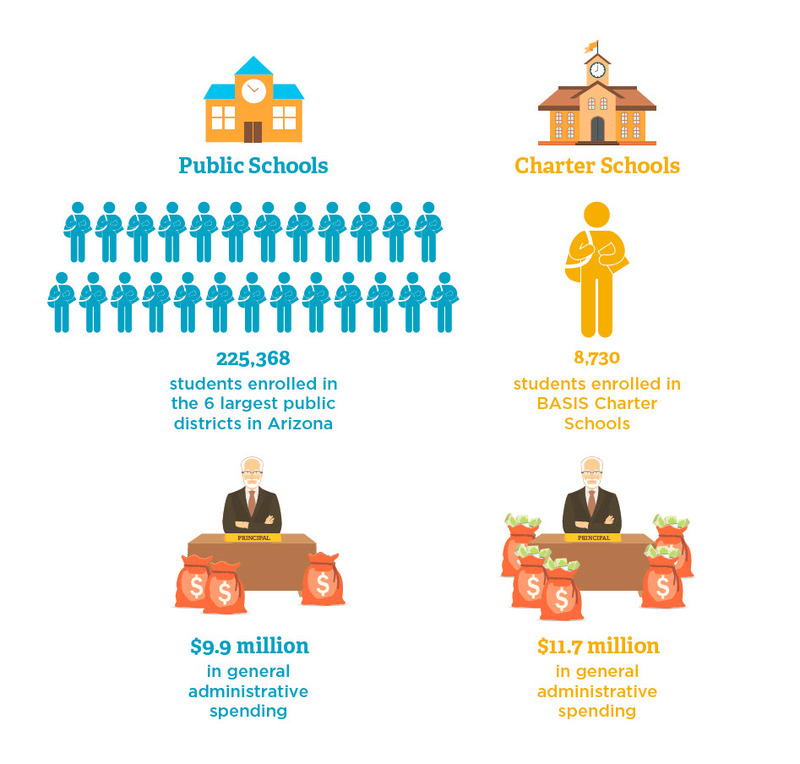 Seven of the largest charter holders/management companies account for a large portion of all higher charter administration spending—$54 million a year beyond public districts. These large charters also spend $19 million beyond the average of all charter schools on a per pupil basis. Each of these charter holders has a larger enrollment than 75 percent of all traditional public districts, yet spend about three times more on administration than districts (see Table 3). Traditional public districts of similar enrollments (5000-9000 students) spend far less per pupil on administration than the large charter companies for administration. Though there is variation between districts from a low of $503 per pupil to a high of $807 per pupil. Overall, their administrative costs are roughly in line with overall district school administrative costs. 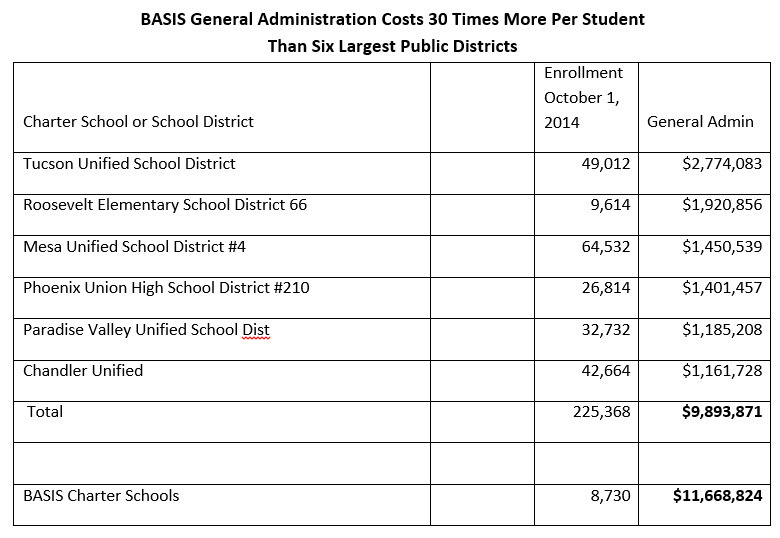 In sharp contrast, although BASIS Inc. has nearly 9,000 students, its size combined with higher administrative expenses leads it to be the most costly, costing taxpayers more than $14 million a year beyond what traditional public schools cost per pupil (see Table 3). Looking at it per school, BASIS averages $2,291 per pupil on administration spending and expended an average of $1.5 million on administration in each school. Public districts of 3,000 students spend a similar amount for the whole district (see Table 5). In BASIS, Inc.’s case their General Administration costs stand out. General Administrative costs alone amount to nearly $12 million for less than 10,000 students, while the six largest public school districts serve nearly a quarter million students for less than $10 million in General Administrative costs. Figure 3 illustrates this stark difference between Public School Districts and BASIS, Inc. Table 6 shows the details underlying Figure 3. The Annual Teacher Fund helps BASIS recruit, retain, and reward high-performing teachers. With private contributions from BASIS parents and community members, BASIS rewards teachers for student learning gains through merit-based bonuses. As a charter school, BASIS receives less state and local funding per student than traditional public schools, making it unfeasible to pay faculty much more than the average teacher salary without the help of the Annual Teacher Fund. We request a monthly donation of at least $150 per student ($1,500 per year), which represents a small fraction of the annual cost of a top private school education. Our goal is for 100% of our BASIS Charter School families to participate in the ATF each academic year. Given the vital role that BASIS.ed teachers play in attaining our top-ranked results and in giving BASIS.ed students the tools they need to succeed with us, in higher education, and in the workforce, we ask that you give as generously as you can. Every gift makes a difference. According to the consolidated BASIS Audit report from June, 2014, BASIS collected $1,936,877 from parents, just over $200 per student, to augment teacher salaries, while BASIS expended $14 million dollars more in administrative costs than traditional public districts. 1000 INSTRUCTION—Instruction includes the activities dealing directly with the interaction between teachers and students. Teaching may be provided for students in a school classroom, in another location such as a home or hospital, and in other learning situations such as those involving cocurricular activities and school-sponsored athletics. It may also be provided through some other approved medium, such as television, radio, computer, Internet, multimedia, telephone, and correspondence, that is delivered inside or outside the classroom or in other teacher-student settings. Included here are the activities of aides or classroom assistants of any type (clerks, graders, teaching machines, etc.) that assist in the instructional process and technology used by students in the classroom or that has a student instruction focus. If proration of expenditures is not possible for department chairpersons who also teach, include department chairpersons who also teach in instruction. Otherwise, department chairperson expenditures should be coded to function 2490. As an alternative to using a separate optional element for course codes, districts may establish course codes under this function. Consolidated administrative costs should be uniform, even if charters differ in the way they classify the categories of administrative costs. Collectively, looking at administrative expenditures as a percent of instruction-related expenses creates a fair comparison. Public school districts spend close to one-fifth (22%) on administration relative to what they spend on the classroom. By contrast, charters spend just almost half on administration relative to the classroom (48%). Charter schools vary widely on the ratio between spending on classroom instruction and administrative costs. There are 46 charters that actually spend more on administration than classroom instruction. While some are very small, a number are of sufficient size that their administrative costs should be much lower than instructional expenditures. The Leona Group and Imagine Inc. manage 17 schools that spend more on administration than on instruction (see pink shaded areas in Table 7) or more than one-third of the schools on the list. The American Charter Schools Foundation and the Kaizen Educational Foundation, both managed by the Leona Group, have 13 schools that combined spent $1,215,717 more on administration than on instruction. Imagine Inc. manages four schools that spent a total of $447,692 more on administrative costs than on classroom instruction. 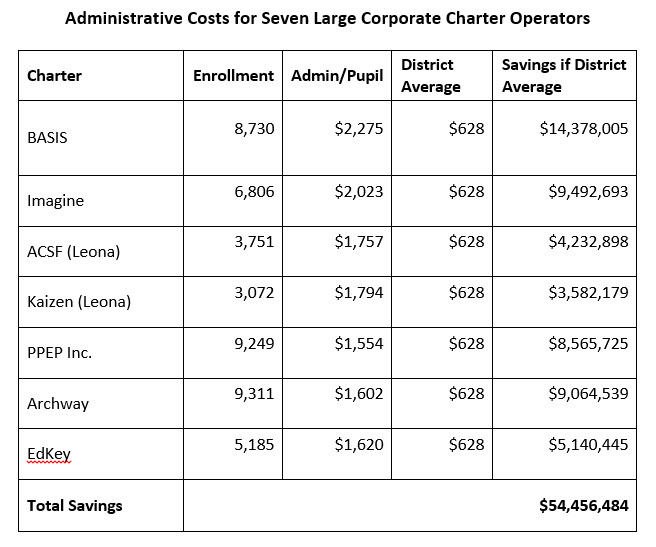 Figure 4 pulls out the six large corporate charters operators to look at how the amount spend on administration compares to the amount spent on instruction. In Figure 4, one of the large charter operators, PPEP, Inc. is excluded. It provides on line learning and spent $19 million on instruction, primarily software fees. It has virtually no facility expenses. Nonetheless, its administrative costs are comparatively high at $1,554 per pupil. Archway is the only large corporate charter that has the same ratio as the overall charter ratio at 48 percent. 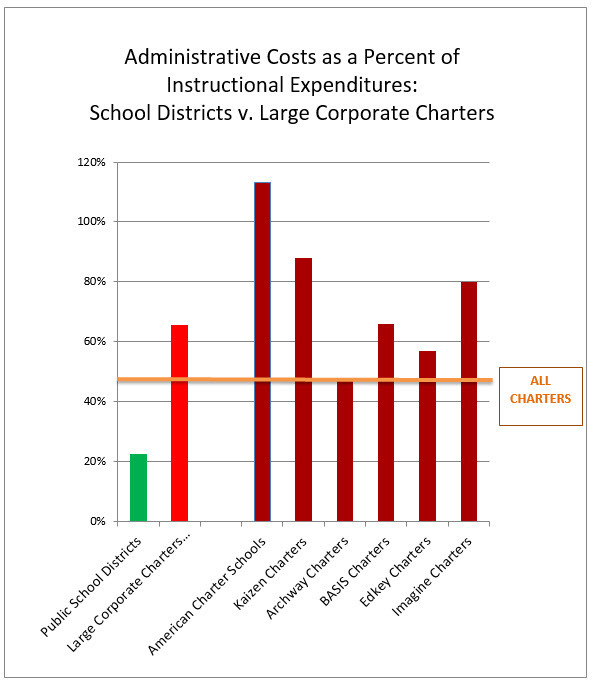 Collectively, the larger corporate charters have significantly higher administrative costs relative to instruction expenses than charters overall and triple that of public schools as seen in Figure 4. 1. 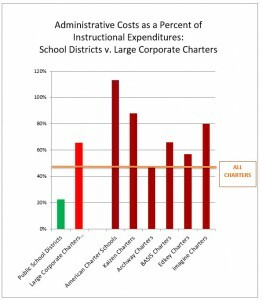 Charter Schools incur substantially higher administrative costs than traditional public schools. The largest corporate charter holders are among the worst offenders. Consequently, potential classroom investments are redirected to cover administrative costs. 2. Arizona‘s lack of charter accountability makes it impossible to discern how what appears as excessive administrative funds are being spent. Public districts governing boards are elected by the local community and must approve all aspects of school management – curriculum, expenditures, hiring and firing of personnel, etc. All administrative expenditures and administration salaries are public records that must be disclosed. The large charter management companies take advantage of this lack of regulation. The seven of the largest charter holders discussed in the study and shown in Table 8 are all non-profit organizations that hire management companies to conduct the operation of their schools including curriculum, students, administration, and all hiring and firing. These management companies are for-profit companies and most have employees who are directly affiliated with the non-profit charter holder. Board meetings of the management companies where decisions are made about salaries and administrative services are not open public meetings and are not subject to public records requests. There is no way to determine executive salaries, administrator salaries or the costs associated with administration services rendered in these corporate charter schools. These are the management companies controlling the seven major charter holders. See Appendix 5 for the names of individual schools. 1. Charter school financial data needs to be collected and monitored by the Auditor General’s Office just as they are for traditional public districts. No additional reporting requirements would be necessary from charters. The Arizona Board for Charter Schools should be required to utilize this data to evaluate and sanction charter schools that misappropriate taxpayer dollars. 2. Charter management companies need to be transparent in reporting salaries and other financial information justifying administration expenses. 3. A public data-base is needed that shows public districts and charter schools expenditures on administration and the classroom, so parents can evaluate school efficiency and priorities when choosing a school. Jim Hall founded Arizonans for Charter School Accountability in September 2014. 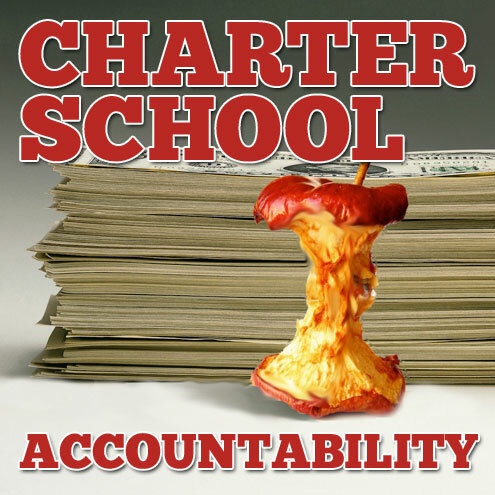 The organization advocates for increased transparency and monitoring of charter schools and takes an active role in filing complaints against charters that fail to follow the few regulations required of charter schools in Arizona. Jim is a retired principal, most recently in the Washington Elementary District. Follow ACSA on Face Book. He can be reached at arizcsa1000@gmail.com. • _Must demonstrate alignment to Arizona’s Academic Standards. • _Must participate in state-mandated annual nationally norm-referenced testing program. • _Must participate in the Arizona criterion-referenced testing program, Arizona Instrument to Measure Standards (AIMS) in grades 3 through 8 and 10. • _Must state clear performance objectives, including percentage of mastery and provide curriculum samples with a clear crosswalk between the curriculum and the Arizona Academic Standards in their charter application before a charter can be granted. • _Subject to sanctions for non-compliance. • _Must adhere to State statutes for submission of an annual budget. • _Every charter school must submit a detailed business plan as part of their charter application. • _Must conduct an annual external audit (both programmatic and financial) with an independent certified CPA. • _Must annually demonstrate compliance with the uniform system of financial records for charter schools (USFRCS) or must demonstrate compliance with Generally Accepted Accounting Principles (GAAP) if they have received an allowed exception from USFRCS. • _Must submit annual financial reports to the Superintendent of Public Instruction regarding funding by program for inclusion in the Superintendent’s Annual Report. • _All charter schools must comply with all state, local, and federal laws regarding health, safety, and civil rights. This includes, but is not limited to, compliance with city and county ordinances in relation to the safety, quality, and location of their facilities. • _All charter schools must have their current Certificate of Occupancy with an E-1 rating and the current Fire Marshall’s Permit on file with sponsor. • _All charter schools must comply with all provisions of the Individuals with Disabilities Education Act (IDEA) as well as comply with any restrictions or regulations related to acceptance of federal funding for start-up or programmatic functions. • _Each charter school must submit annual demographic and ethnicity data for the Superintendent of Public Instruction’s Annual Report, as well as periodic enrollment counts throughout the year by which their apportionments are adjusted. • _Each charter school is required to keep a public file of education qualifications and work experiences of all current and former teaching staff available for any parent to view. • _Each charter school is required to have a five-year contract compliance review by their sponsoring entity. • _Each charter school must submit annual school profile data by school site for Arizona School Report Cards. • _Charter school teaching staff and/or volunteers who work with students must have a fingerprint clearance card issued through the Arizona Department of Public Safety for tracking purposes. • _All charter school staff must be background checked upon employment. In accordance with our complaint processes, the information you provided to this office on October 7 and 27 regarding American Charter Schools Foundation and Kaizen Education Foundation were forwarded to the respective entities for a response. The responses to each are included with this correspondence. The Board, in its oversight responsibilities, holds charter holders accountable for the timely submission of AFRs and tracks the timely submission of budgets through the compliance portion of the annual audit. The Board does not utilize the information contained in those documents in its oversight; rather, the Board has adopted a Financial Performance Framework and an Operational Performance Framework for its purposes in monitoring the charter holders in its portfolio. More detail regarding these documents is provided below. In August 2012, the Board adopted its Financial Performance Framework and Guidance (“financial framework”). The purpose of the financial framework is to communicate the Board’s expectations for ensuring that all charter holders in its portfolio are viable organizations with strong fiscal management practices. The financial framework gauges both near-term financial health and longer term financial sustainability. The portion of the financial framework that tests a charter holder’s near-term financial health is designed to depict the charter holder’s financial position and viability for the upcoming year. The portion of the financial framework that tests a charter holder’s longer term financial sustainability is designed to depict the charter holder’s financial position and viability over time. Charter holders meeting the desired standards demonstrate a low risk of financial distress. Charter holders not meeting the desired standards may currently be experiencing financial difficulties and/or may be at a higher risk for financial hardship in future. The Board considers the financial performance of a charter holder at various times during the contract term. The full financial framework is available on the Board’s website. The full operational framework is also available on the Board’s website. • The charter holders have provided sufficient information that identifies errors that occurred and corresponding corrective action. No further information will be requested from the school. • The Board has provided information on its oversight processes that include an evaluation of the charter holder’s financial and operational performance. This matter is therefore closed. BASIS Ahwatukee 078212000 700 BASIS ed. BASIS Flagstaff 038707000 533 BASIS ed. BASIS Tucson North 108737000 952 BASIS ed. BASIS Peoria 078588000 746 BASIS ed. BASIS Chandler 078589000 731 BASIS ed. BASIS Oro Valley 078575000 550 BASIS ed. BASIS Phoenix Primary 078231000 587 BASIS ed. BASIS Oro Primary 108404000 653 BASIS ed. BASIS Prescott 138786000 369 BASIS ed. BASIS Mesa 078225000 577 BASIS ed. BASIS Tucson 108725000 852 BASIS ed. BASIS Scottsdale 078736000 755 BASIS ed. BASIS Phoenix 078403000 725 BASIS ed. Edkey, Inc. *** 078971000 479 EdKey Inc.
Edkey, Inc. 078742000 447 EdKey Inc.
Edkey, Inc. 078740000 329 EdKey Inc.
Edkey, Inc. 078915000 574 EdKey Inc.
Edkey Sequoia Choice Schools 078705000 766 EdKey Inc.
Edkey, Inc. 078246000 1082 EdKey Inc.
Edkey, Inc. 138705000 512 EdKey Inc.
Edkey, Inc. 078744000 64 EdKey Inc.
Edkey, Inc. 078917000 479 EdKey Inc.
American Heritage Academy 138754000 453 EdKey Inc. Imagine Avondale Elem 078535000 553 Imagine Inc. Imagine Avondale Middle 078553000 196 Imagine Inc. Imagine Camelback Middle 078531000 168 Imagine Inc. Imagine Camelback Elem 078519000 487 Imagine Inc. Imagine Desert West Elem 078520000 819 Imagine Inc. Imagine Coolige 078536000 685 Imagine Inc. Imagine Desert West Middle 078532000 316 Imagine Inc. Imagine Tempe 078523000 280 Imagine Inc. Imagine E Mesa Middle 078521000 131 Imagine Inc. Imagine Surprise Middle 078522000 308 Imagine Inc. Imagine Prep Coolige 078547000 508 Imagine Inc. Imagine Superstition Elem 078537000 179 Imagine Inc. Imagine Prep Surprise 078538000 248 Imagine Inc. Imagine Superstition Middle 078552000 93 Imagine Inc.
Bell Canyon Charter School, Inc. 078972000 404 Imagine Inc.
Cortez Park Charter Middle School, Inc 078975000 240 Imagine Inc.
Rosefield Charter Elementary School Inc 078508000 765 Imagine Inc.
West Gilbert Charter Elementary School, Inc. 078935000 334 Imagine Inc.
West Gilbert Charter Middle School, Inc. 78974000 92 Imagine Inc.